Lake Inari is infused with the mysticism of the Sami, and Nellim Wilderness Lodge lies at its very heart. It is here that Jouko and Mari have painstakingly converted a former school house into an authentically crafted hotel that reflects the local culture. 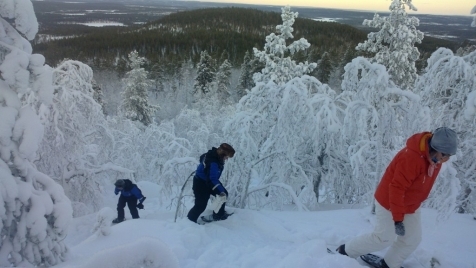 This most tranquil of settings is home to a warm and magical atmosphere, where you will enjoy snowmobile and husky safaris, spend a day in the wild with a reindeer herder and practice the ancient Sami arts of snow shoeing and cross-country skiing. 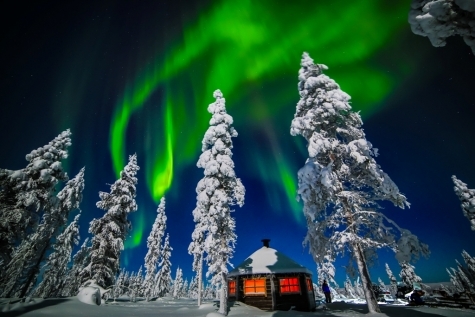 The Northern Lights swirling above the pine forest make for an unforgettable experience. Nellim is also home to the Aurora Bubble. Each individual and romantic pod has heating, private eco WC and a comfortable double bed from where you can view the star-lit sky. Located on the water’s edge, the north facing pods have specially formulated curved glass ceilings, which allow you to watch nature unfold. Nellim has an impressive Northern Lights record, so should the conditions be right, you may be rewarded with your very own performance of the Aurora Borealis swirling above you. 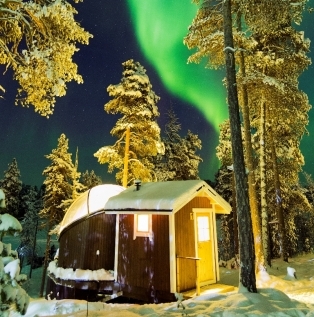 We can incorporate a night in an aurora bubble into your stay for a supplement. 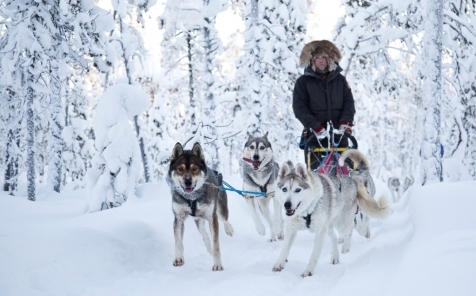 Fly to Ivalo (via Helsinki) and transfer to Nellim Wilderness Lodge. Programme briefing, dinner and overnight for 5 nights. After breakfast receive full instructions on how to drive a snowmobile, before setting off with your guide on a 50 km journey, which covers perfect fell scenery with forests and frozen lakes. Stop along the way for lunch around an open fire, returning to the hotel early afternoon. After dinner, depart for Nellim’s Aurora Camp. Keep a look out for the Northern Lights from the heated lakeside cabin, whilst hot berry juice and snacks keep you warm, inside and out. Today meet Nellim’s pack of Alaskan huskies, whose kennels are just a short snowmobile sled transfer from the hotel. After instruction mush (in pairs), through the silent forest. Lunch is served back at the hotel. The remainder of the day is at leisure before supper at the hotel. Today test your prowess for snow shoeing, followed by an evening snowmobile excursion to a special spot by the lake to stake out the Northern Lights. Dine at the lodge. 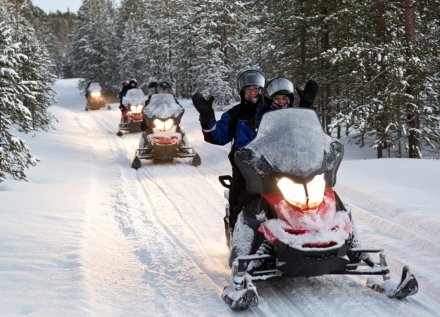 Board a snowmobile sled and head into the forest to meet a reindeer herder tending and feeding his herd in the wild. Continue along the shores of Lake Inari, with a stop for lunch in the company of local fishermen before continuing back to Nellim for supper and a final night of Aurora spotting. Breakfast and transfer to Ivalo airport for your return flight back to London (via Helsinki). This former school house has been lovingly converted into an authentically crafted hotel that reflects the local culture. Located in an Aurora hot spot, this warm and cosy property captures the essence of rural life in Finnish Lapland, which is enthusiastically shared by its owners, Mari and Jouko. Although small, Nellim offers adaptable accommodation including hotel rooms, apartments, and cabins that are flexible enough to lodge couples, groups of friends and differing family sizes. Nellim is also home to the Aurora Bubble. Each individual and romantic pod has heating, private eco WC and a comfortable double bed from where you can view the star-lit sky. Located on the water's edge, the north facing pods have specially formulated curved glass ceilings, which allow you to watch nature unfold. In addition to the hotel’s restaurant there is a welcoming lounge and a bar handcrafted by Jouko himself.